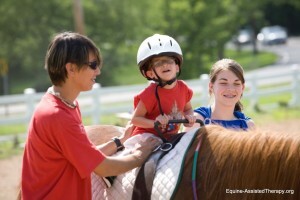 Equine-Assisted Therapy simply wouldn’t exist if it weren’t for our amazing volunteers. In a typical week, more than 150 volunteers walk through our doors. Each act of kindness within this program, no matter how small, creates a ripple effect that is felt for generations. To volunteer in a class, you must be able-bodied and able to make a regular commitment (even if it’s only an hour a week). Volunteers who work directly with horses need to be at least 14 years old. We have volunteers who help in a variety of other ways (event support, maintenance skills, etc.). If you’d like to know more about volunteering outside of a class, contact our office for more information. Many of our volunteers admit that they began serving to help the children in our program but were surprised by how therapeutic it was for them as well. It’s fulfilling enough to watch a child develop physically, emotionally, and relationally; and it’s even more rewarding to know that you were an influential part in that child’s development. It touches your heart in a way that is beyond words. Click here to download the application. Be sure to fill out the entire application and sign ALL required documents. You can hand deliver your application, scan/email it, fax it, or send it by post mail. Everything you'll need to know is on the first page of the volunteer application. All applications should be submitted to our Wildwood office. We count on our volunteers for each class, so we ask that you make a regular commitment, even if it's just an hour a week. We'll contact you to discuss what class time(s) you're able to commit to. Without enough volunteers, our participants aren't able to ride. Once your application is processed, we can begin your volunteer training. You'll need to watch our 25 minute training video before your first lesson (typically viewed 30 minutes before their first class). Then you'll be ready to jump right in. Our seasoned volunteers will help you as you go. The main responsibility of the leader is the control of the horse during a lesson. The leader should not interact with the rider and should keep their focus on the horse. It is the leader who must help in guiding, stopping and starting the horse in a way that assists the rider but doesn’t hinder their learning. Leaders must be able to walk a fast pace and jog intermittently during the lesson. Leaders must go through special training to learn how to work with therapy horses, as they are not your typical trail horse and require special cues and handling. You must also be willing to continue your education beyond the initial training to make sure that you are consistent with the program’s policies regarding the equines. You must be a regular sidewalker for at least a session of 7 weeks before you can apply for our leader program. The main responsibilities of a barn buddy is the feeding and care of the equines. Barn buddies feed, water and medicate the horses, clean stalls and report any health concerns to the Program Facilitator. Because of responsibilities, barn buddies must be able to lift at least 50 pounds, be reliable, have confidence (a hungry 1,100 pound animal can be intimidating) and have a willingness to learn. If you are under 18, a parent must be trained as well. If you are under 16, a parent must be present while you’re on site. 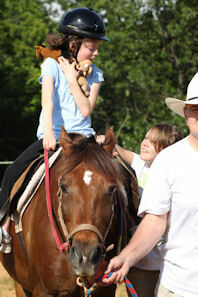 Due to insurance restrictions, barn buddies are not allowed to exercise/ride the horses. We always need help with special events and maintaining our facilities. We’d love to know if you’re able to help with catering, landscaping, tiling, electrical, concrete, manual labor, fencing, plumbing, grant writing, painting, printing services, gardening, keeping the office/porch clean. If you’re willing to donate your skills and a little bit of your time, contact info@eatherapy.org to let us know how you’d like to help!